Yeah, that’s not a typo! 92 POINTS, $11!! Plus --- well, it’s National Taco Day! What goes better with tacos than crisp, juicy, bracing, lip-smacking, crushingly-bargain-priced-from-your-favorite-wine-merchant Sauvignon Blanc? Let’s PARTY! On a super-serious note, we are REALLY super-serious about Sauv Blanc when we taste. We RUN AWAY from the grass/hay/cat pee/green bean/jalapeno styles --- we literally run. Nope, we want sweet grapefruits, lemon/lime, lemon pie, a bit of tropicality and we want cheek-smacking, hoo-boy, lip-licking freshness. This is imperative!! So, we really liked this one, oh yes, but we nearly fainted upon getting it at this price. You NEED a case of this. $11, c’mon!! That’s less than an order of al pastor tacos, for goodness sake. Maybe 2 cases. Did we say 92 points? Lemon pie, starfruit, sweet herbs, even a little mint and tarragon going on here, clean and fresh and soul-satisfying. BOOM! Your drinking needs are done! The price is... , oh, sorry excuse us, the Mexican food truck (La Perla de Jalisco) that parks out front of our office is here. Later! Intense citrus and floral notes are combined with flavors of white peaches and nectarines that are enhanced by the well integrated acidity. It’s long and vibrant with an impeccable clean smooth finish. Grapes are hand harvested at night, maximizing freshness and vibrancy with whole cluster pressing directly into concrete eggs, neutral barrels and stainless steel barrels. This allows us to try different techniques during fermentation in terms of temperatures and cloudiness of the juice, which reveals varying aromatics making this wine very expressive and unique. After fermentation, we stir the lees every two weeks for eight months, obtaining a smooth and complex mouthfeel, without losing its freshness. Crafting fine wine is steeped in Ritual and grounded in terroir. We endeavor in creating beautiful wines that are a reflection of this special place. Much like our low-impact farming methods in the vineyards, we believe in gentle handling and the revival of Old World winemaking techniques in the cellar. The grapes are hand-harvested in small batches at first light in the cool morning and carefully double-sorted. Whole berries are added to open-top tanks with hand-punch downs during fermentation. Wines are basket pressed, and only native yeasts are used obtaining a natural balance and greater purity. 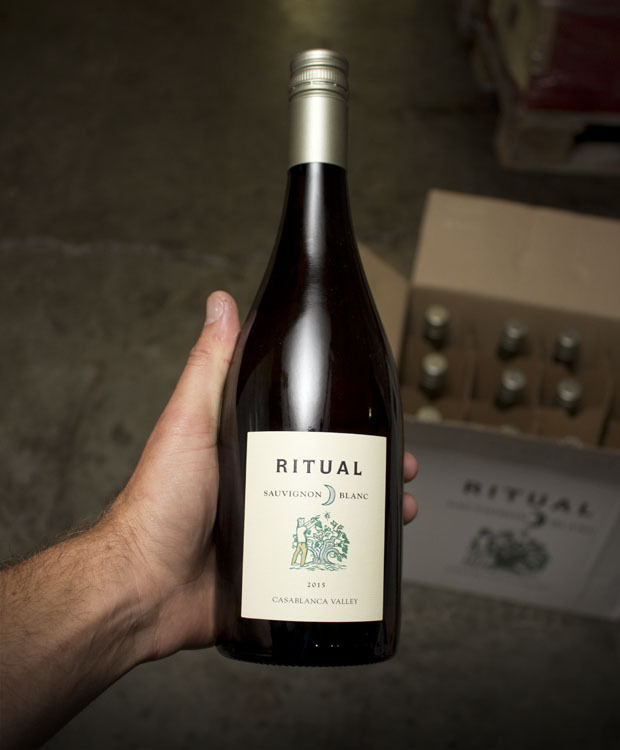 Ritual wines use different containers that deliver unique characteristics. Chicken, Pork Chop, Tilapia, Sea Bass, Perch, Sole, Haddock, Trout, Cod, Redfish, Halibut, Snapper, Mussels, Crab, Lobster, Clams, soft cheeses, herbs, green & mixed veggies.